One of the great anchors in my spiritual life is my Sunday School class. Adult Sunday School is unfamiliar to many, but ours is almost 40 people strong, committed to missions and supporting the work of our local church, and studies a wide variety of material throughout the year. I am more accountable to study when I know this group will all have done so, and I get more from scripture when I hear a variety of insights. 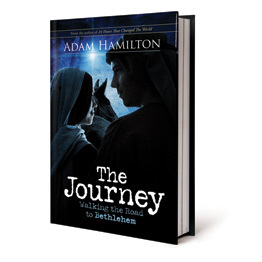 It's not unusual for our class to study material that fits with the church calendar, so I didn't think too much about the decision to undertake The Journey: Walking the Road to Bethlehem, by Adam Hamilton this Advent. I am excited to write that the study has already made a marked difference in my appreciation of Advent. In the book, Hamilton explores the birth of Christ from a historical, archaeological perspective. He relies heavily on Scripture, but adds relevant information about the geography and character of the Holy Land, that many modern Christians might not be familiar with. For example, simply considering that Bethlehem is about an eighty mile journey from Nazareth by foot, changes the way a person thinks about the trip. Hamilton also has published a DVD series, targeted at groups, that adds significantly to the study. In the video messages, Hamilton tours the sites in the Scriptures, many preserved as places of worship today. Slowly reading the Scripture, the book's narrative about the events in the text, and then seeing the sites, makes for a multifaceted view of the familiar story and aids in my understanding of the actual events. It's worth noting, that the author does push the reader to consider elements that might be controversial to some. For example, was Joseph more likely a young man, middle-aged, or even elderly? Hints point towards a variety of answers, but I appreciated the encouragement to contemplate the questions, without feeling threatened if I came to a different conclusion than the author proposed. Doctrinally, the core is solid, and considering tangential details adds to appreciation of the story, rather than chipping away at the structure. As another piece to the study, a short daily devotional book for the Advent season is also available. My wife and I each purchased a copy, and are so far enjoying the daily insights. Advent should be a time of contemplation and consideration of Jesus Christ's coming into our world. These study materials have helped focus my attentions on the events of Christmas. Whether you regularly engage in Bible study, or it hasn't been a habit, I'd encourage you to consider "The Journey" as we begin Advent this year.